Okay, this experiment was (apparently) deliciously successful and fuel for years of pregnant lady anecdotal material. Martha Stewart’s special holiday issue this year had a recipe to make homemade limoncello, the intensely strong, super lemony Italian liquer. I thought this was the perfect gift for a few choice people on my list, so I decided to make it. Now, remember that I couldn’t actually taste test it all. So I have no idea how it came out flavorwise, except what Adam and friends have told me. They said it was great. 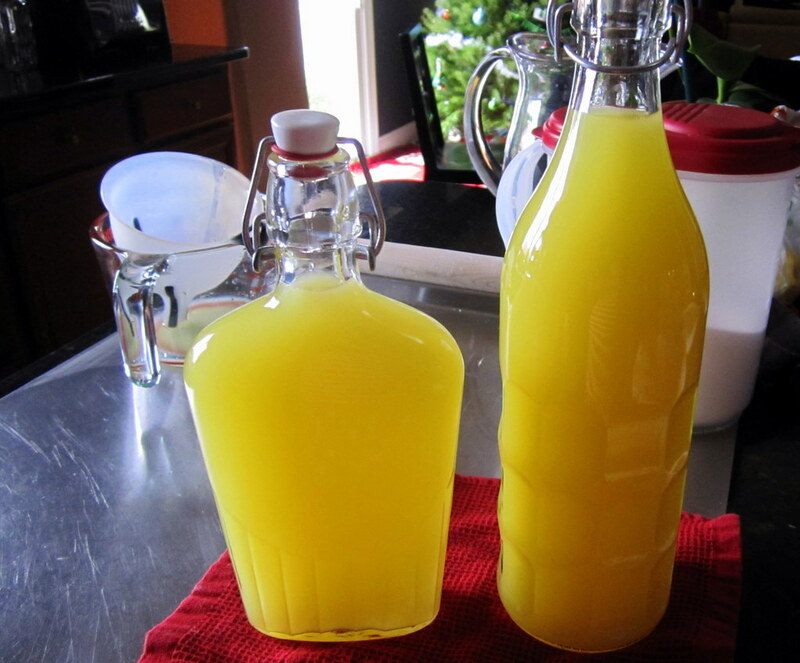 This will produce 1.5 liters of limencello, which fit nicely into the bottles pictured above. I actually made 2 batches with 2 bottles of Everclear so we’d end up with about 3 liters total. Peel strips of zest from the lemons using a vegetable peeler (note: this is really difficult if the lemons are soft. Make sure you use really fresh ones). Save the remaining lemons for something else, you only need the peels for this. Combine the zest and the Everclear in an airtight container and let stand at room temperature for at least 2 days or up to 1 week (I left mine for a week and a day!). When the peels have steeped for as long as you want them to, stir together the sugar and water until completely dissolved. Combine the sugar mixture and the Everclear mixture in an airtight container. This is when it goes from vaguely yellow and clear to super cloudy and bright yellow! 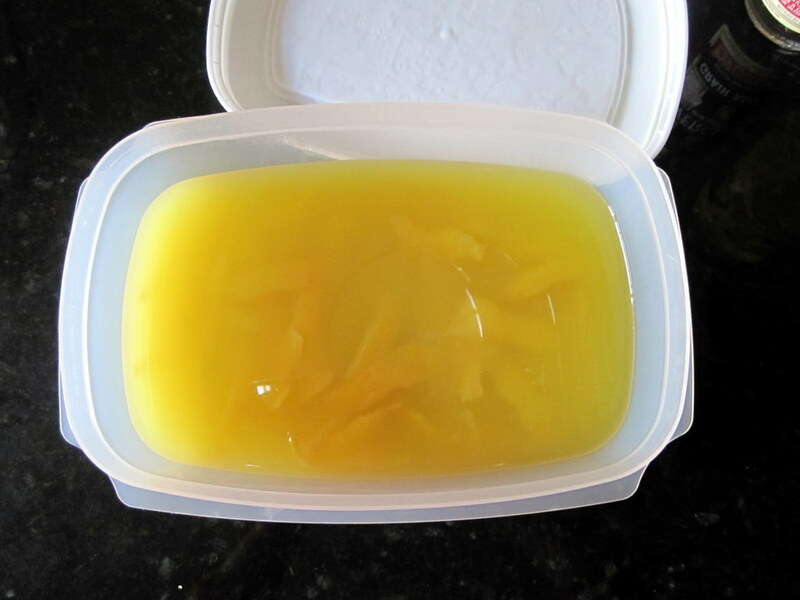 Refrigerate the mixture overnight. 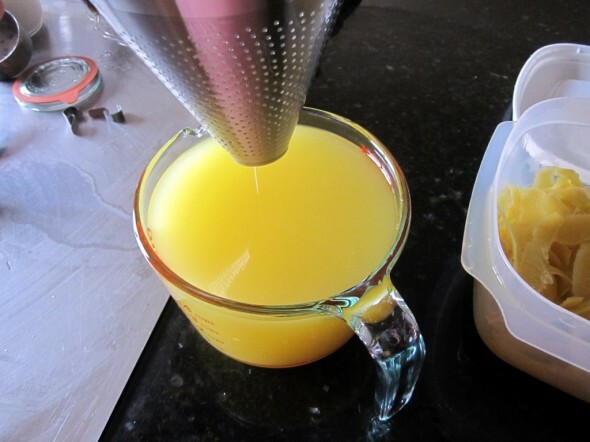 Pour liquid through a large sieve to filter out the zest (discard the zest). Use a funnel to divide the limoncello into airtight bottles. I got mine at The Container Store. And that’s it, that’s all you have to do. I wrote the recipe out on gift tags so the giftee could make more when it ran out. 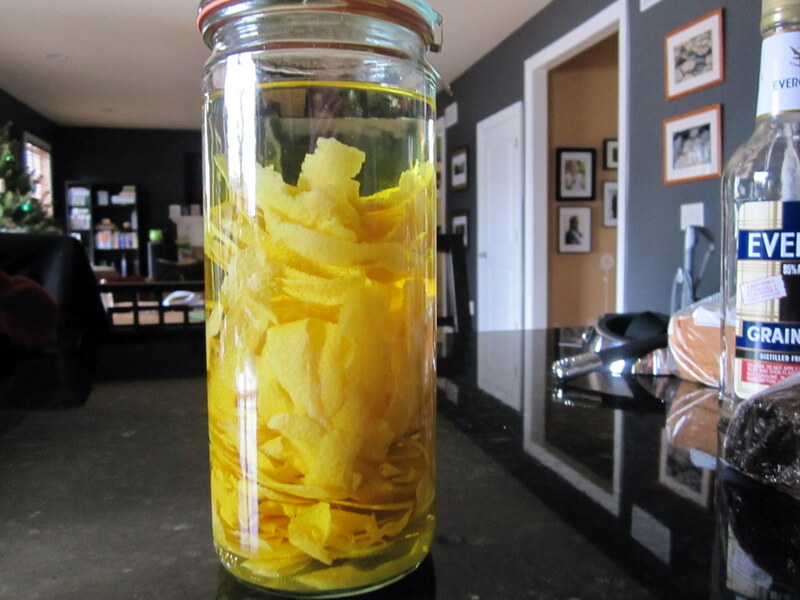 According to the recipe, the limoncello will last up to 3 months if stored in the freezer. I suspect it will last longer than that, since good Italian limoncello lives on the shelf forever.